This is an original publicity poster for the 2003 Annual Meeting of the American Alpine club, SIGNED BY JIM WHITTAKER WITH BLACK MARKER. This is not a modern copy. It is original from the AAC meeting where Whittaker signed it. 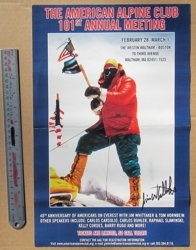 The poster is illustrated with a color photo of Whittaker on the summit of Mount Everest in 1963. The poster measures 43.5cm tall x 18cm (17.13 inches x 11 inches). This poster was produced to publicize the meeting and was not offered for sale. Very few of these were produced and even fewer were signed. CONDITION: Original thick (not thin -- almost card stock) grade paper with strong coloring and no fading. 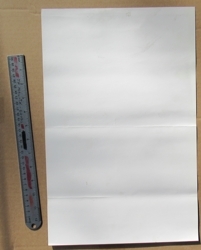 There are two horizontal crease marks across the width of the poster, one at the middle and one in the lower half. It is clean and has no tears or pen holes. This poster has been signed at the meeting by Jim Whittaker with black marker pen in the image area. Price: $75.